Vascular Surgery, Hyperbaric Oxygen Therapy and Wound Care? Why? Many people have asked me how it came about that these 3 relatively diverse treatment modalities have found a home in my practice. The answer can be summarised in the word inter-disciplinary. After completing my pre-graduate medical training, I decided to specialise as a General Surgeon. During my training I was exposed to Vascular Surgery, which I realised was my calling / vocation. During a Fellowship in Sydney, I was exposed to Advanced Wound Care for lower limb ulcers. 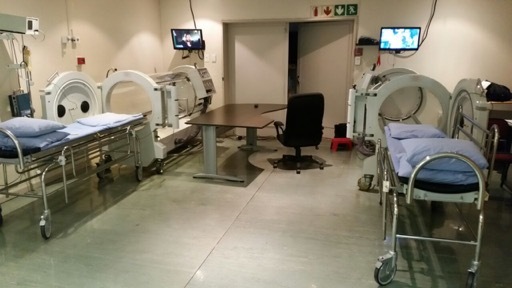 A short period after I started working at the Eugene Marais Hospital, I was exposed to Hyperbaric Oxygen Therapy. The application thereof in the area of ischaemic lower limb ulcers tweaked my interest. I soon found myself actively involved in Hyperbaric Oxygen Therapy: 5 months after completing a course, I took over the Hyperbaric Unit. Three years later I was able to attend the International Interdisciplinary Wound Care Course at the University of Stellenbosch, where I received formal training in advanced wound care. The strange marriage of vascular surgery, hyperbaric oxygen therapy and advanced wound care, makes it possible to offer patients with complex wounds the most appropriate care, tailored to their specific requirements.